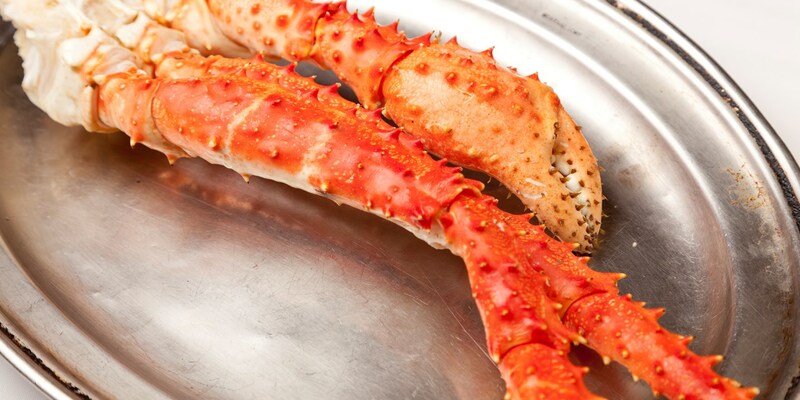 Highly sought after for their sweet flavour and giant meaty claws, the meat from the king crab can be eaten hot or cold, and is delicious in a variety of dishes like simple sandwiches and salads to crab cakes and linguine. King crab is sold in clusters of long, thick legs, which are then cracked open. The key is to ensure you have nice, intact, presentable pieces of meat like in Dave Watts' glorious recipe for King crab with leeks and sea vegetable salad. The fleshy king crab meat pairs well with a variety of flavours and seasoning as is reflected in our versatile collection of recipes. Also, king crab meat can be steamed, boiled, grilled and baked and pairs well with other seafood too, such as in Matthew Tomkinson's delicious, nutrient packed recipe for Alaska salmon with braised lettuce and king crab.